passionate case for the importance of adaptive trial and error in tackling issues such as climate change, poverty, and financial crises—as well as in fostering innovation and creativity in our business and personal lives. 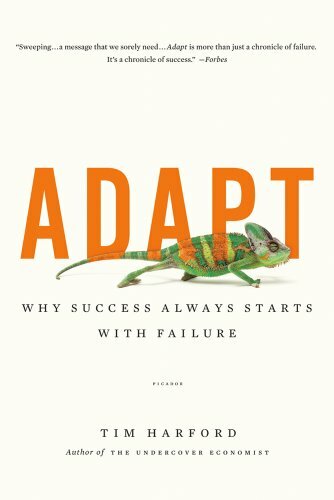 Taking us from corporate boardrooms to the deserts of Iraq,Adaptclearly explains the necessary ingredients for turning failure into success. It is a breakthrough handbook for surviving—and prospering— in our complex and ever-shifting world. Tim Harford is the author of The Undercover Economist, The Logic of Life, and Adapt. He writes two columns for the Financial Times, and his work has appeared in The New York Times, Forbes, Esquire, Parade, New York, and Wired. He lives with his family in Oxford.